Well, I have given up on the Tropical Vegetable Forum because it has been utterly useless for months now. So I'm placing this here. Ate my first ever Yacon today. It was pretty easy to grow. Related to the sunflower, so makes a pretty looking plant that eventually produces small orange sunflower-like flowers (no seeds). When the flowers all die, and the plant starts to die (some 6-8 months after planting), the tubers are ready to dig up. It looks like a potato, but tastes like a cross between watermelon and a mild apple. Sweet, crispy, juicy, refreshing. You can eat them raw, like jicama. I think you can cook them also, but I didn't try. Supposed to have multiple medicinal benefits: ability to regulate blood sugar levels, lower “bad”/LDL cholesterol, help with weight loss, lower blood pressure, improve the health of the liver, prevent certain types of cancer, boost digestive health, and strengthen the immune system. Note some have an allergy to the plant, like one might to anything, but it seems fairly rare. I have not had a bad reaction as yet. Normally I would taste anything brand new in multiple tiny stages over days to be sure, but I wasn't really thinking and just dove it and ate the whole thing. Whoops. So far so good. You're supposed to pick it and let it cure for a day or two first before eating, which should make it sweeter, but I was so excited to try it I completely forgot about that. I could have done more to make the plant happy, but as it was not my first priority, it's good too know they don't seem picky! Anyone else have experience with these? I got to try these earlier this year at Top Tropicals. Only had a small taste but reminded me of water chestnut in texture. I only tried a small piece. I was already loaded down but this is definitely back on the list to plant! I had similar taste experience with Yacon. I am patiently waiting for true seeds of Yacon. I am hoping to get them soon and try sprouting it out. Hopefully the off spring will produce fertile seeds. This site has a wealth of info which sounds like it comes from experience. The advantage of the FOS content is that it is not digestible. That is also the disadvantage. The bacteria that live in your gut will have a party when you send some yacon their way and, as the landlord, this can result in some discomfort for you. The situation is similar to that of the more infamous Jerusalem artichoke, which is well known as a gassy vegetable. Jerusalem artichokes contain mostly inulin, a sugar with a high degree of polymerization (Kays 2008) that many people find very difficult to digest, sometimes painfully so. In contrast, yacon contains mostly FOS molecules with a lower degree of polymerization (Hermann 1997); they are still undigestible, but they require less fermentation by bacteria in your gut before they are fully broken down. That means much less gas. Even if you have had trouble with Jerusalem artichokes, you will probably find that you have little difficulty with yacon. Yacon can also have a laxative effect in large doses (Geyer 2008), although I think that, much like the gas, this is a sign of eating too much, too fast, not a consequence of regular yacon consumption. The trick to enjoying yacon is to start slowly. Very simple to grow and undemanding, like sunchokes (Jerusalem artichoke). To me, yacon tastes similar to jicama or carrots. Unlike sweet potato, yacon doesn't vine and take up a lot of space. Tastes like a sweet sweet carrot, easy to grow & propagate more for next time. Always eat it after a day or two, but take care not to damage when removing from soil. Great tuber. Extremely productive. Clumps get very large. Make sure to give lots of soil depth for proper formation. 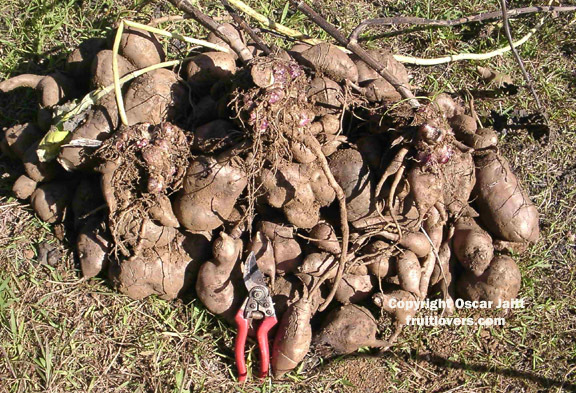 When plants are happy they will produce incredible amounts of tubers. Taste and texture similar to jicama, but much sweeter and better. Don't find any similarity to carrots, which are much harder in texture and stronger tasiting than yacon. It's also an extremely adaptable crop, doing well in very many climates. Apologies for hijacking the thread - but Oscar seeing as you have Yacon, would you happen to have Oca, Lairen and Arrachacha as well? Already have the common arrowroot, yacon, jerusalem artichoke and looking for other starchy crops - roots/tubers/rhizomes. Thanks! I'm curious about arrowroot. Do you grow from seed, do you like the taste, what experiences can you share? When you write Lairen, is this what you mean (Leren)? No, don't have the others you mentioned. They don't do well here. I have both types of arrowroot - Canna edulis (Queensland arrowroot) and Uraro (Philippine arrowroot) Maranta arundinacea. Have bought them off a random seller at the weekend market (Sidcor Sunday Market) and I've discovered as long as you have consistently moist soil, you can harvest the mature tubers by brushing off the loose soil and twisting off bigger rhizomes and both plants will just bounce back - watering with compost tea/bokashi tea might help them bounce back faster after an exploratory digging. You can actually take rhizomes say in clumps of two/three each then replant them if you want to fill up a bigger area - doesn't matter if they're mature or not they will grow provided the weather is favourable. Uraro starch or even the boiled (and peeled) root is actually very bland but I'm very fond uraro cookies so I keep replanting them. Queensland arrowroot (canna) can be bitter in stir fries (or maybe it's because I used a very gnarly, old rhizome) so I'd recommend an overnight soak, peel, preboil (throw away the water you used to boil the canna rhizome in) then cut/grate and use in soups instead. As an update, I'm happy to report I had no ill effects from eating the whole Yacon raw, now that it is several days later. I look forward to hopefully sampling more in the future! Glad this instance of being hasty with my new-food-sampling did not take a wrong turn, because normally I try to be careful when tasting anything that is totally new to me. I do not have a lot of allergies, but I do have a few, and my immune system can go haywire in the wrong circumstance. Next time I will leave the yacon out on the counter for a few days first, as you're supposed to, for the sweetest flavor. The one I had was very pleasant, so I look forward to it tasting even better than the 1st experience in future! Correction, have grown arrowroot (Canna edulis) and it did fine here. I'll actually be receiving some Lerén soon, if my friend comes through for me. I didn't even know about it 'till recently, and it's apparently one of the oldest vegetables on the island. My friend compares it to water chestnut, which sounds great to me. I'd like to get my hands on both arrowroots as well. I have a thing for bland veggies, they can take a lot of seasoning. Where did you get your Yacón? It sounds like it has potential for some pastry recipes, maybe grated and/or glazed. I've been wondering for a while now as to why the T. Vegetable forum hasn't been merged as a sub-forum of the T. Fruit forum. I know they deal with different things, but the difference seems a little arbitrary. After all, there's a sub-forum for Temparate Fruits (which don't qualify for "tropical", even if they can be grown there), there's regular discussion of nuts and other products that don't qualify as "culinary fruit", some botanical fruits are left out because they're considered culinarily vegetables (like the tropical "Capsicums"/Peppers), and we're clearly not limited to trees (with topics covering anything from passion vines to strawberry plants). Why not merge? *Edit: Then there's the fact that some people (myself included) would rather not require a separate log in just to discuss a related topic. Odds are good that the topic would receive much more attention by this forum's members if it was a sub-forum. methods. I would like to try again. I bought mine at Rareseeds.com. They had an excellent sale late in the season. Perhaps you can ask LivingParadise or Oscar (fruitlovers) if they can share some yacon crowns? It might be easier to grow as their yacon have proven to be quite productive. I've found them easier to intercrop with cassava (Manihot esculenta) (in a tropical setting) - just give the cassava a few week's headstart so they act as windbreak/support for the yacon's brittle stems. Alternate rows work just fine - I find both rootcrops have similar water/soil requirements. Just want to check if yacon can grown in a true tropical environment? Seems the orgins of it is from the mountainous andes. And I stay in Singapore. Also, can I start growing if I only have the tuber grown bought from the market? Yes yacon can be grown in the tropics. I've grown it here in Hawaii. Yes it can be started from tubers. Yacon produces 2 types of tubers, ones that look like sweet potato and other smaller ones that look like jerusalem artichokes. For propagation use the tubers that look like jerusalem artichokes. Don't know if you can get those in a store. The stores here tend to sell only long tubers that look like sweet potato. Jet the edible tubers that look like sweet potatoes commonly sold in SG generally just rot when planted if you know people who regularly attend SGF (Singapore Garden Festival) perhaps you can ask around and find someone willing to swap/sell those gnarly knobby tubers that they call yacon crowns - used for planting; failing that, you might want to try to buy from NZ and Thai nurseries though - they seem to be able to get planting materials send out with minimal fuss (and cost) to SG and neighboring countries. Bumping this up to move to the vegetable forum. I don't have any left - the plants flowered and died. I really hope the roots I saved will sprout into new plants, but nothing so far. Maybe in the rainy season? Also, I wrote a whole bunch of threads for the original Veg forum, and I'd hate to remake all of them. I hope they can be moved over!